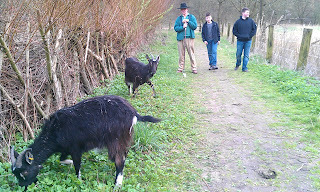 NOTE: I just re-ran this route this evening, 3 April, 2012, and updated the route and added a lot of pictures. Düsseldorf is a medium-sized city, with a variety of great jogging routes. 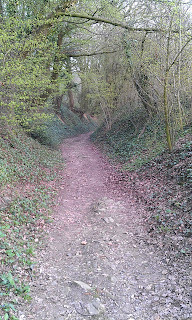 You can head along the Rhine River, head through the beautiful beechwood hills of the Stadtwald forest, or find similar country in the Gerresheim neighborhood, on the north edge of the city. 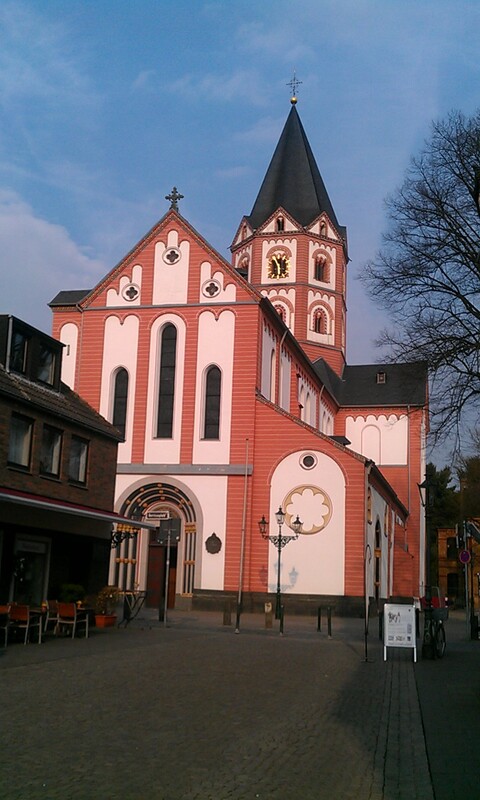 I like Gerresheim because it combines a beautiful village center with wooded hills and valleys just east of the neighborhood. You'd never guess that you are on the edge of a real city. 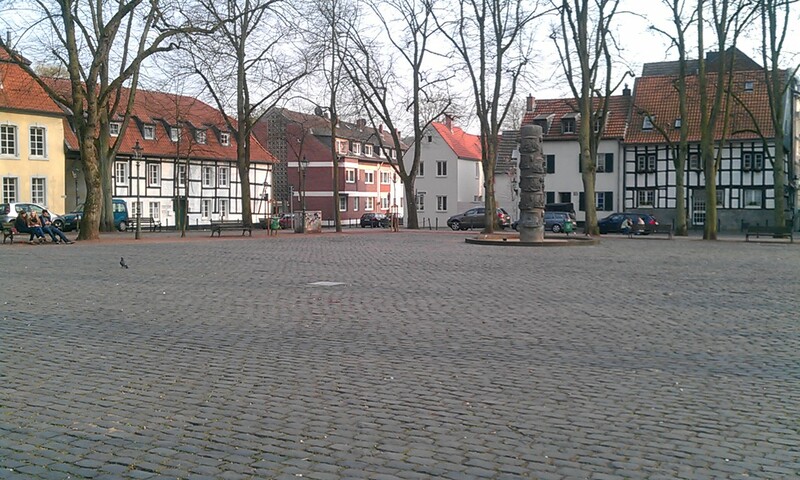 Gerresheim was once a separate village, and it still preserves some of the small-town feeling. 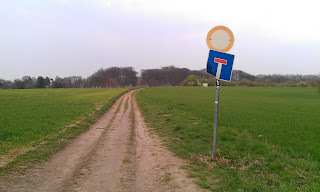 I was back in Düsseldorf a couple of months ago, and the idea of running in Gerresheim pulled me there like a magnet. GETTING THERE: You can get there easily by taking the 703 streetcar, or even the S-Bahn commuter train, if you don't have a car. If you take the 703 streetcar, get out at Gerresheim Rathaus (town hall). You are then right there in the center of the village. The 709 and 713 streetcars also go to Gerresheim, but then you have to get out at Gerresheim Krankenhaus, the end of the line, and jog a kilometer down Gräulinger Straße. From the Rathaus, jog the 2 blocks eastwards down Neussertor to the old, romanesque St. Margarete Church. 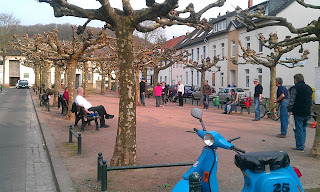 There is a beautiful, quiet old square on the south side of the church. Now, turn right and go diagonally southeast through the square onto Steinweg. 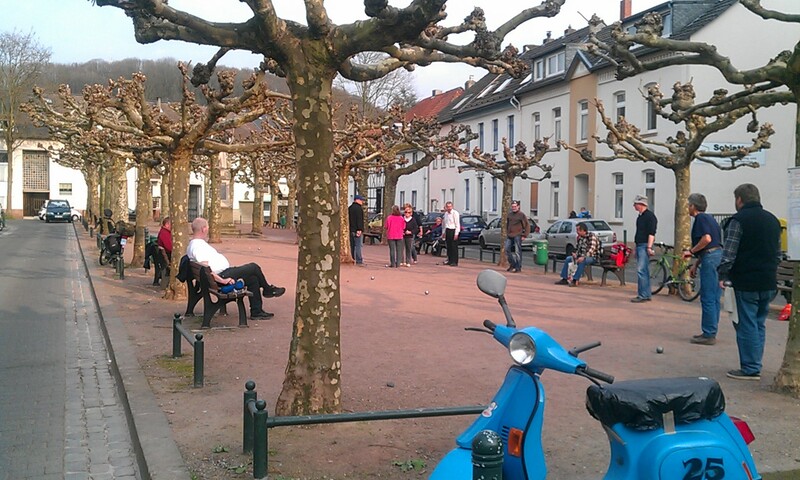 Run south on Steinweg, first going past the old market with its twin rows of sycamore trees and boules courts. Steinweg soon ends at Quadenhofstraße. 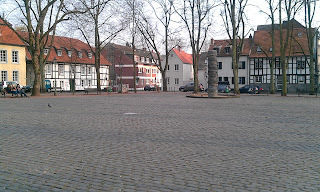 At Quadenhofstraße, turn left, and the street will curve to the right, taking you south again. You'll see the wooded hill along your left side. Right at the curve, you'll see a place where they sell gravestones for the nearby cemetery. Turn in here, just before the gravestones, and jog the path up to the top of the hill. The last part is pretty steep! At the top, you'll come out to a farm field with a tall radio tower on the hilltop. Note down its silhouette: that cylinder-shaped tower will be your landmark to help guide you home. 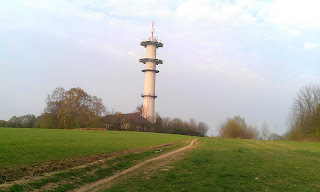 The radio tower: remember this silhouette! We will now run northwards along the hilltop ridge, before turning right (eastwards) and running downhill to the next valley, before finally heading south again. 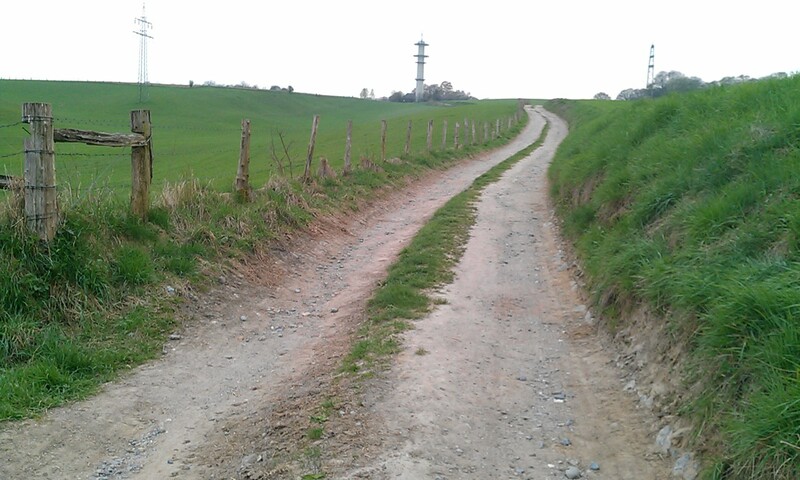 We'll head uphill again at the radio tower from the other side again at the end. The first part of the trail is totally unmarked. But don't worry, if you follow these directions, you should be fine. And if you get lost, what better spot to be running in circles than in this green paradise? Just turn left and follow the edge of the field. At first, there is woods to your left, then another field opens up on the left side. 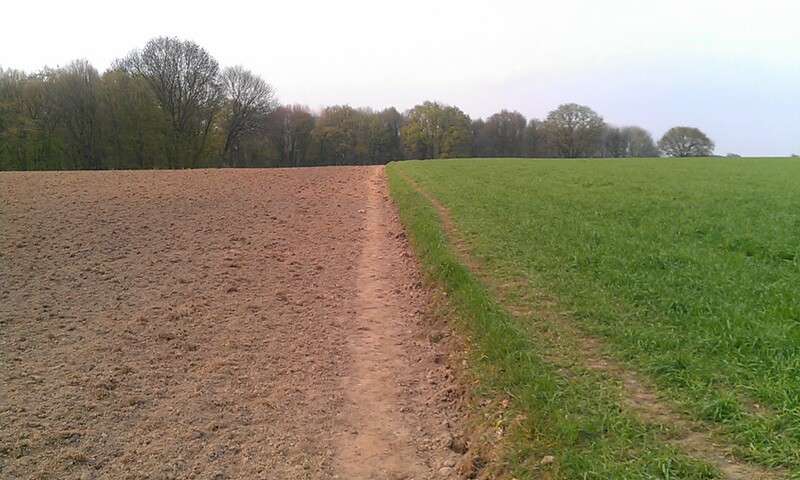 Just follow the little unmarked path as it curves around to the right. When the path runs into the paved road, turn left. 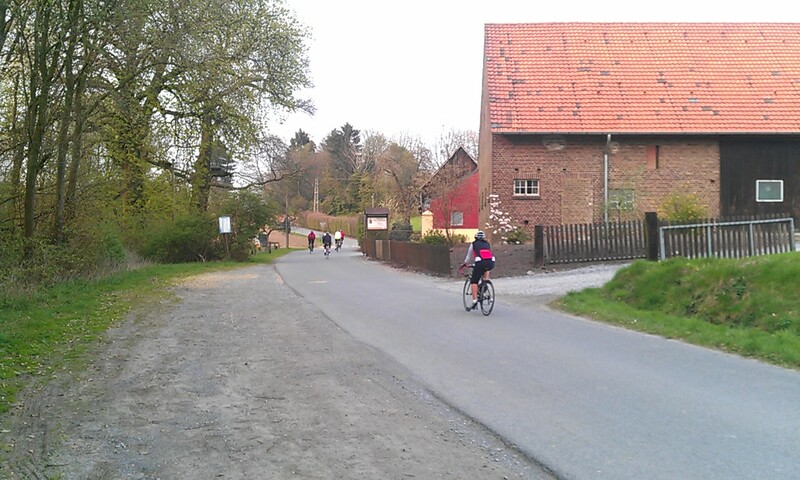 When you come to Dernbuschweg on the left, you come to your first farmhouse, the Trotzhof. There might be a few cars on the street here, but we'll soon get off this street. 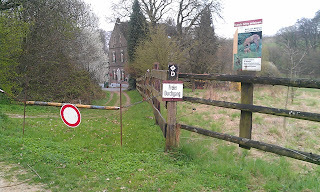 After 200 meters, turn right onto the little dirt road with the "dead end" sign, Schäperhofweg. Notice the trail markers on the sign for the "D" and the diamond-shaped symbol. This is the way east to Schäperhof! 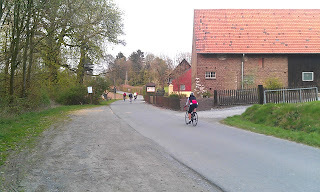 We'll now follow the dirt road across the fields and then downhill to Schäperhof farm. The way downhill: watch those rocks! When you get to the farm, just continue through the gate and go right through their front yard. Strangely, this is the public footpath, with the trails continuing. Just after their barn, the trails turn to the right and go down across the little stream that runs through Rothäuser valley. When you cross the stream, the paths turn right and begin heading south. We are now at the half-way-point of the run, heading back home. 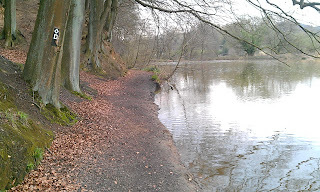 The path gets pretty swampy at times, but normally people have thrown enough branches over the deep, black mud to make them passable without sinking in to your knees. You will soon come to a series of ponds along the stream. At the last pond, the path sudden turns left to up over the next hill instead of following the water. Follow the way uphill, as it curves to the left. At the first little path that goes down to the right, take it! We are now leaving the marked paths again. 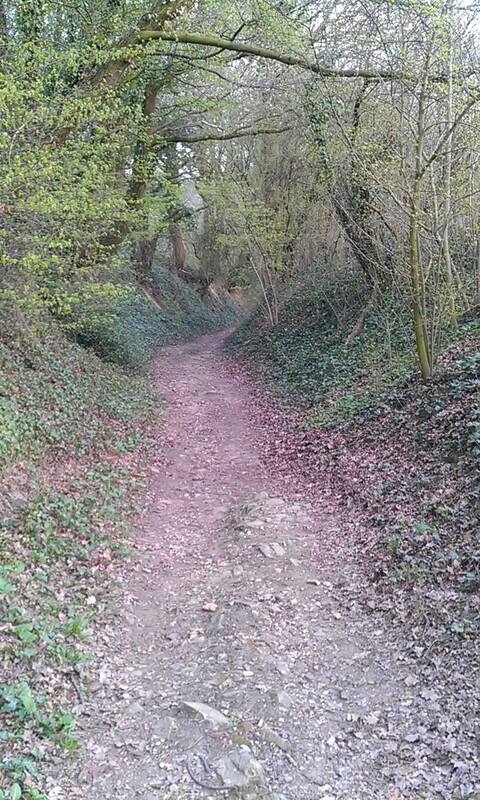 The small, unmarked path goes downhill, to the right. It will come down to the stream again, where you cross the water on a willow-tree-lined path. On the other side of the stream, at a farmhouse where the farmer has a love for old-timer cars and motorcycles, turn left and take the dirt road to the next farmhouse just a few hundred meters south. 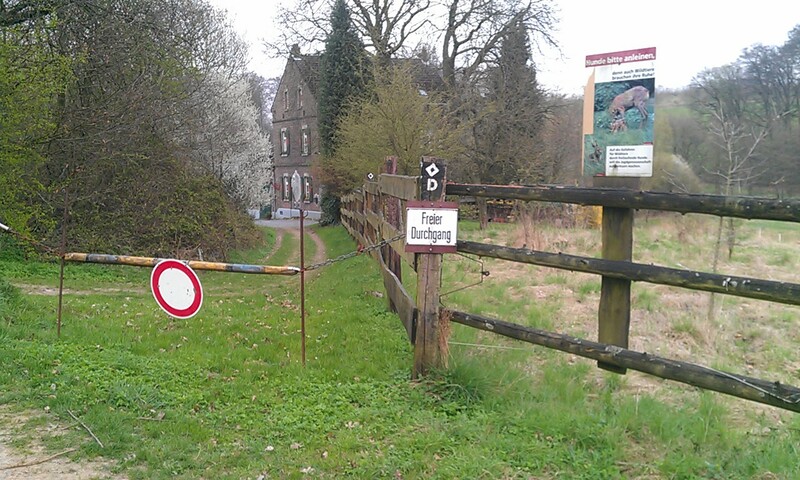 Just before the fenced farmyard, turn left on the little path that heads along the fence, uphill towards the radio tower again. Another long climb! At the hilltop, run straight past the tower on the little path that goes between the fields. This heads right to the spot where you first saw the tower. 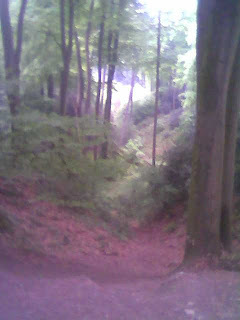 Now follow the path downhill through the woods, the same way that you came, and follow it back to the start of the run.